Around 1927, when Prohibition was the law of the land, a "drab three story building of grey brick" at the southeast corner of Sunnyside and Broadway was razed, leaving a large empty lot. 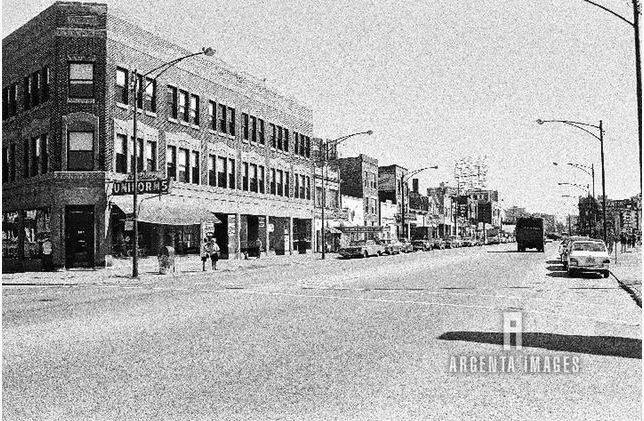 As the Tribune archly put it at the time, "The corner store long harbored a drug store, but this emporium was forced to close following the sale of certain liquids which Mr. Yellowley feels Chicagoans should eschew." 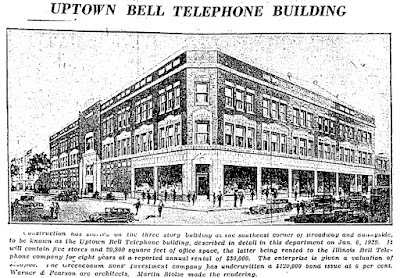 In early 1929, it was announced that a new building would be erected on the site, to be known as the Uptown Bell Telephone Building. 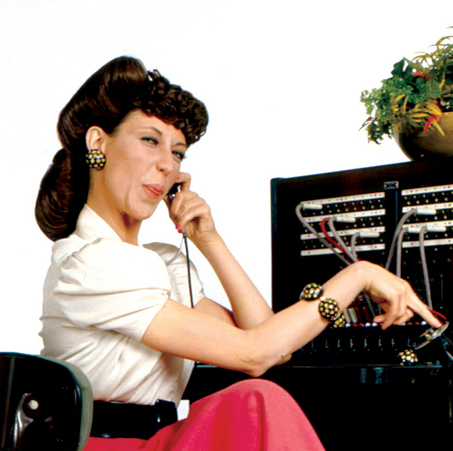 Illinois Bell commissioned it as a telephone exchange, administrative offices, and what we'd now call a customer service center, with 250 employees, including information operators. The building was three stories high, and in a fit of optimism, the foundation was designed to support the weight of three additional levels, in case Illinois Bell wanted to expand at a later date. (No upward expansion was ever undertaken, probably because the Great Depression began the same year as construction got underway.) The ground floor was divided into five storefronts, several of which were rented by Illinois Bell to serve customers, and one was leased by John Cook Pharmacy. The Tribune called the new building "an improvement which should be an important factor in the development of the southern portion of Uptown Chicago." The outer walls were built from "Bedford stone" and it was noted that the building was fireproof. Construction costs were estimated to be $250,000 ($3,415,000 in today's money). No one was willing to admit publicly how much the land cost to acquire. John R. O'Connor was the architect. Fun Fact: Back in the day, phone numbers started with words, which referenced where the exchange was located. 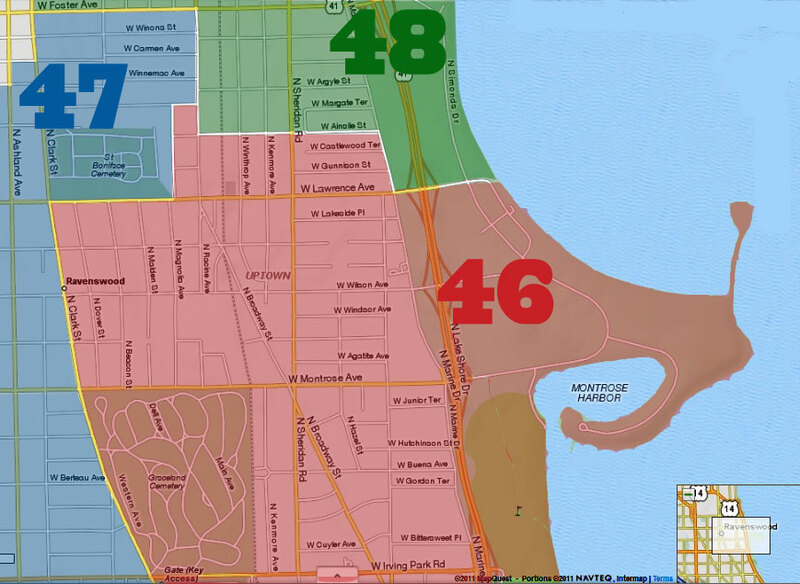 Many North Siders had phone numbers that started out SUNNYSIDE4, which meant that the wires and equipment for those numbers were located right across from the present-day Target store. By 1948, Illinois Bell decided to consolidate its North Side commercial offices and vacated 1025 Sunnyside. The administrative offices moved into a new building at 5627-35 Broadway (now long gone). 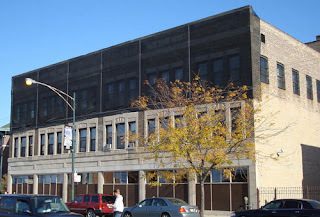 The old SUNNYSIDE4 exchange moved to 5100 Clark (which building still stands). 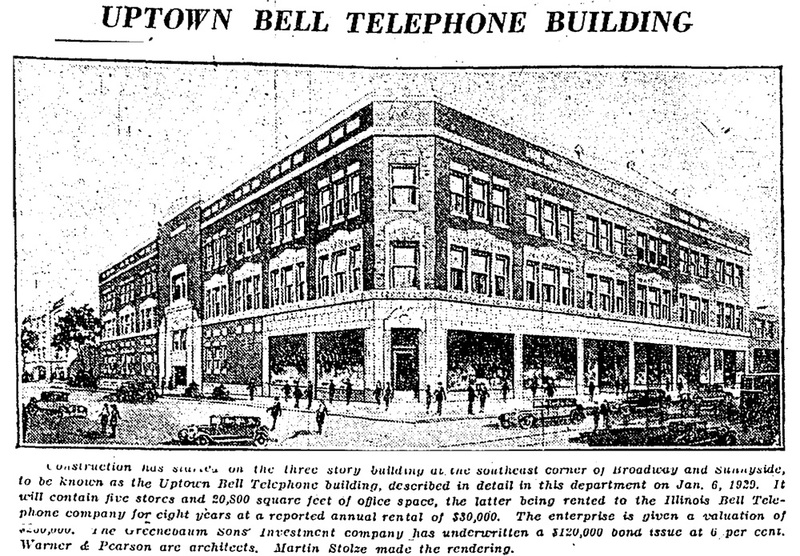 A mere 19 years after it was built, the Uptown Bell Telephone Building no longer housed the phone company. So what would its next purpose be? on Uptown Update before, and can also be seen here. As these grainy photos of American Uniforms show, the ground floor remained retail. 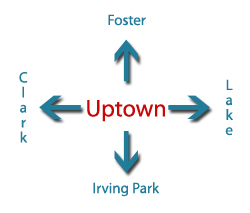 The 2nd and 3rd floor offices were rented out to various companies, including the city's Department of Urban Renewal, whose mission was to fight Uptown's encroaching blight. DUR gave owners of some buildings grants for rehab, and oversaw the demolition of buildings in other areas to make way for the McCutcheon School annex on Kenmore, Arai School (now Uplift) on Wilson, and Truman College, among others. In 1969, wealthy bank president/real estate developer Thomas F. Seay bought the building and donated it to the Salvation Army, an organization dear to his heart (he was on the board of directors for 20 years, until his death at age 91). 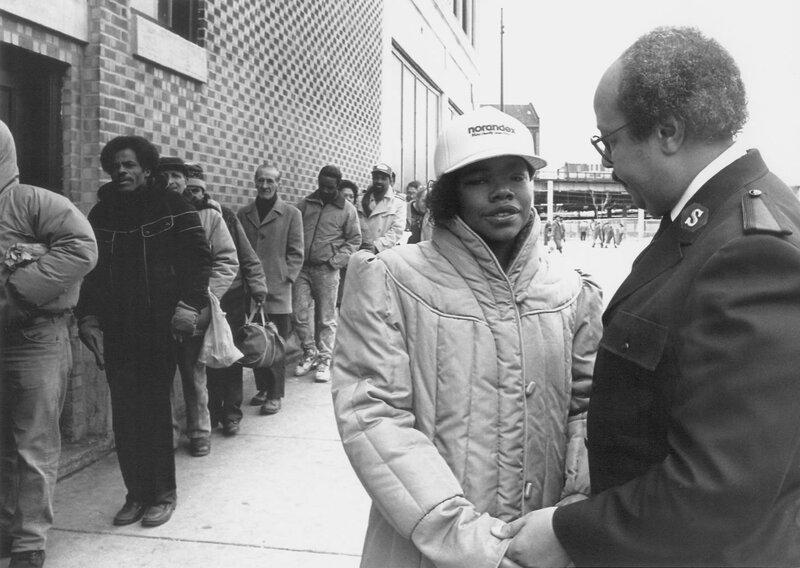 Salvation Army's website displays the photo below of people lining up for services, and says, "In 1969, The Tom Seay Service Center opened in Uptown, housing an alcoholism residential treatment center, a crisis counseling clinic, a home for teenage runaways, and a food pantry." And so the Salvation Army provided meals, shelter, and counseling at Sunnyside and Broadway for the better part of four decades. By early 2008, the building had fallen into severe disrepair. Netting went up to protect pedestrians from pieces of masonry falling off. Salvation Army stopped using it as an overnight shelter in March 2008 because it was found to lack proper zoning, but continued to provide day services and serve meals to its clientèle. By early October 2008, the windows were boarded up, moving vans emptied the building, and a "For Sale" sign went up. So did scaffolding, as the building continued to deteriorate and became a hazard to passersby. 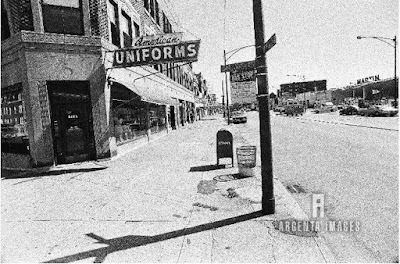 A place which had once housed an agency whose mission was to halt urban blight had itself become a prime example of urban blight. Then-alderman Helen Shiller proposed buying the building with Wilson Yard TIF funds, presumptively as an aquaponics center, or fish farm. Those plans, er, tanked, and the building sat empty until development company Cedar Street bought it in 2012, with plans to eventually move its corporate headquarters there. Salvation Army received $1.2 million from the sale with which to continue its good work. Cedar Street spent several years completely rehabbing the building: repairing the extensive structural problems, taking down the scaffolding, replacing the plywood and old windows, and restoring it to an approximation of what it must have looked like in 1929. 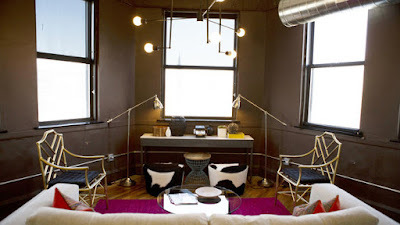 In December 2013, the Chicago Women's Health Center was the first new tenant in many years, moving into offices on the second floor, and offering quality healthcare on a self-pay sliding fee scale. In January 2015, Cedar Street made good on its promise to move its corporate headquarters to Uptown. You can see here a photo gallery of what its "Google-ish" offices look like inside the building. 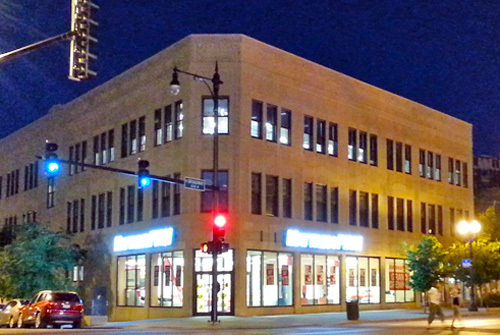 In 2015, Mattress Firm opened in the largest ground-level retail space, and Sprint is currently building out the adjacent storefront for its Uptown/Edgewater store. For the first time in 40+ years, the building is back on the tax rolls, bringing in both sales and property taxes. Just as when it was built, it will house a phone company (if not the phone company) and a corporate headquarters. Just as it did during the four decades Salvation Army owned it, it has a tenant that serves the public, regardless of income level. After 86 years, the building has gone back to its roots.